Health Complaining Does These 2 Things To Your Brain! 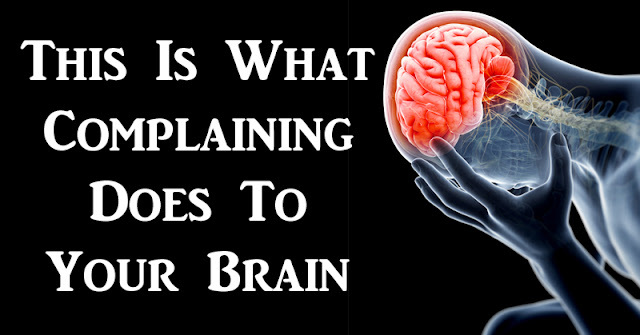 Complaining Does These 2 Things To Your Brain! Neuropsychologist Donald Hebb believed that neurons that fire together are wired together. Meaning, a group of neurons connect in the brain as a result of specific life experiences. When you have a thought, feeling, or a physical sensation, thousands of neurons are triggered. They all come together to form a network. The brain then learns to trigger this same network of neurons with repetitive thinking. Based on this theory, if you constantly focus on negativity, criticism, and stress, your mind will have an easier time bringing up those same thoughts in similar situations. Your thought patterns have the ability to wire your brain to either react positively or negatively to a situation. Repeated complaining actually rewires your brain to make future complaining more likely. Over time, you begin to develop a more negative mindset, regardless of what’s happening around you. When a new situation arises, your brain automatically defaults to complaining. When you feel like complaining, is there a certain friend or family member you always turn to? Maybe someone who is willing to dwell on the negativity and have a brooding party with you? Data from multiple studies published in Clinical Psychology and Psychotherapy shows that co-brooding is associated with internalizing your problems, depression and anxiety. In other words, engaging in repetitive, unproductive discussions about your problems can promote further emotional distress. If you’re constantly dishing to your friends about your problems, you may think you’re just venting, but you’re actually increasing your negative feelings. A study published in Developmental Psychology found that girls who share problems with their friends experience a strengthened friendship, but they also experience an increase in depression and anxiety. Alan Kazdin, professor of child psychiatry at Yale University said the findings of these studies are a warning to parents. “A little bit of talking about problems is fine, but much focus on trauma, injury and problems can incubate – increase or exacerbate – their effect,” he explained. We’re all human. Complaining often comes naturally. However, focusing on positive thoughts the majority of the time will help your brain react more positively to different situations in the future. It’s all about your attitude. Research conducted at the University of California, Davis, found that people who worked daily to cultivate an attitude of gratitude experienced improved mood and energy, along with less anxiety due to lower cortisol levels. There are a few things you can do to help reduce complaining. Try to think of something you’re thankful for whenever negative thoughts begin to arise. Replace your complaints with feelings of gratitude for the people in your life, the roof over your head, or something that makes you happy. The second thing you can do is stop and think before you complain. Ask yourself what outcome you’re looking for by complaining. Do you want someone else to tell you that you’re right? Are you looking for sympathy? Do you just want to complain for the sake of complaining? If you feel that your complaint is justified, be specific about the problem instead of going off on a tangent about multiple things. Remember to be mindful of the person you’re complaining to. If you get defensive, chances are so will the other person. Lastly, try to end on a positive note. Look for a way to compromise or remedy the situation.